Mom and Daisy on their way back to the car on Manana trail. I have a growing list of favorite Oahu hikes to share with you. 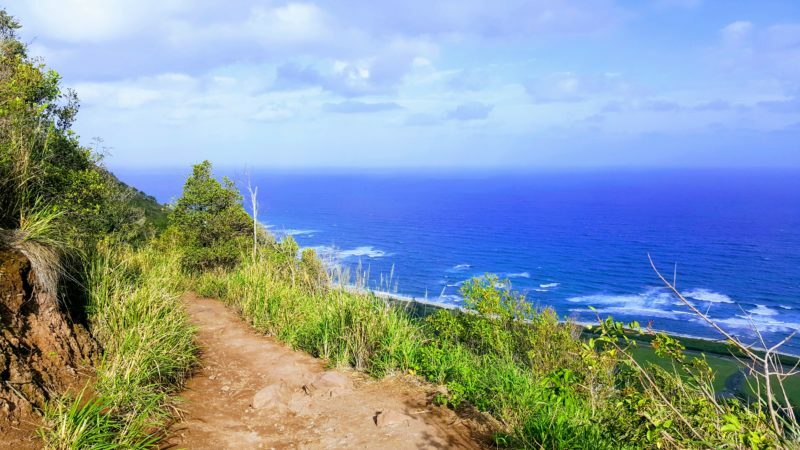 Popular hikes such as Diamond Head, Manoa Falls and Makapuu lighthouse are not the only beautiful trails on this island. There are so many hikes out there that don’t make it into every Waikiki magazine. A huge plus is that these hikes aren’t crowded and you’ll feel like you’re the only one there. It’s difficult to know which local Oahu hikes are excellent and which are just so-so. Here are my personal recommendations for fun hikes with great views and few people. For those staying in Waikiki, this one is pretty hard to reach, but I highly recommend it if you have the time. Hawaiian monk seals are commonly spotted here lazing about in the sand working on their tan and it’s a favorite gathering spot for humpback whales during whale-watching season. 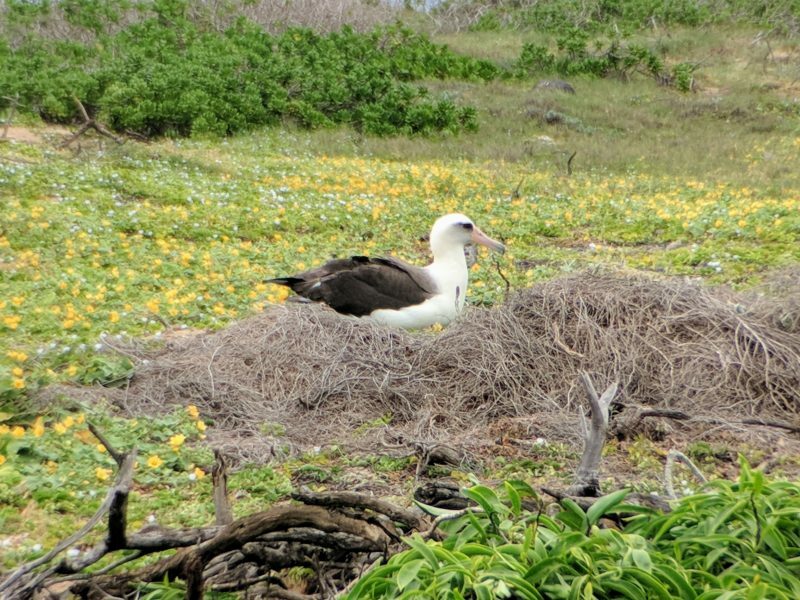 The actual Kaena Point is also a bird sanctuary and is fenced off to protect shearwaters, their underground nests and chicks, and laysan albatrosses. If you’re staying at one of the Ko Olina resorts, you’re very close to the Kaena Point Makaha trailhead. For those staying near Haleiwa or in the North Shore, Kaena Point’s Mokuleia trailhead is where you’ll want to start at. Visitors staying in Waikiki can still reach Kaena Point, it will just take a bit more planning. Pair Kaena Point with a dolphin snorkel from Waianae harbor along the Waianae coast (Makaha) or combine it with a visit to Haleiwa or the North Shore (Mokuleia). Local Tip: I recommend the Mokuleia trailhead for those short on time because you’ll be able to reach Haleiwa in about 20 minutes after the hike and immediately start exploring the North Shore. A Laysan albatross keeps a watchful eye on me at Kaena Point. The Manana trail is such a fun hike that most Oahu visitors don’t get a chance to explore. The trailhead is at the very top of a long uphill residential road and most of the hike has fantastic views on both sides. About 30 – 40 minutes in, you’ll reach a fork in the trail. Going left will take you up to the ridge where the view gets even better. Going right will take you down to Waimano Falls where there are 2 pools and a waterfall. One section of Waimano Falls is even nicknamed “Cardiac Hill” because the uphill return climb can literally take your breath away. Another fun point on the Manana trail is all of the strawberry guava growing wild on the side of the path. Stop and pick a few for a snack, or you can even gather a bunch and make some jam. 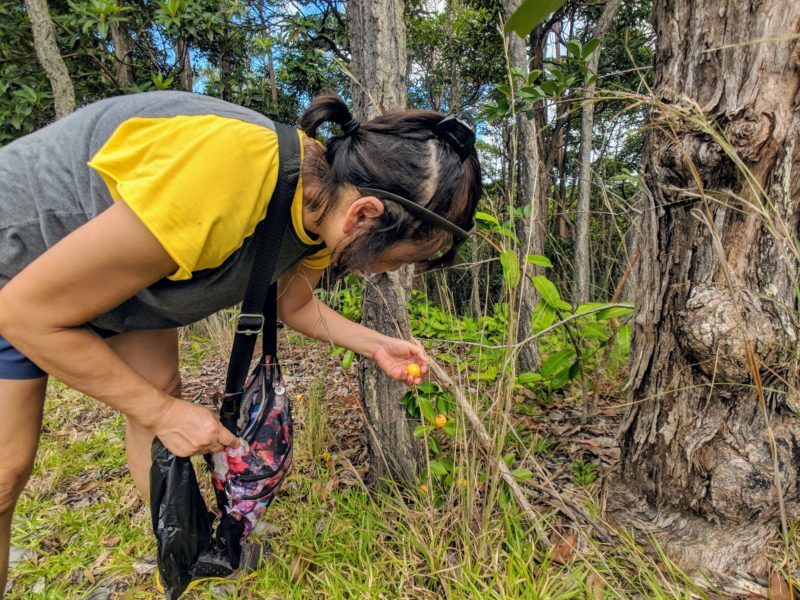 Mom picking the uncommon yellow strawberry guava fruit on the Manana trail. The Kuliouou ridge trail is a fantastic hike that I find myself recommending to anyone who asks. It’s a good 3 – 4 hour hike where the environment is always changing from tropical forest to striking ironwood pine trees. And that last third of the trail has AMAZING views all the way up. Reaching the top is a feat (the stairs at the end can be a killer if you aren’t used to hiking), but it’s totally worth it. The ocean, towns and mountains surround you and the area is wide enough that it never gets crowded at the top. Local Tip: Pack a small lunch and enjoy it at the top. The way down is all downhill so you shouldn’t get a tummy ache. Mom and Daisy on the top of Kuliouou. If you’re near the North Shore and are looking for unbelievable views, Kealia trail is a perfect choice. The whole way up is a nonstop switchback trail along the side of the mountain and believe me when I say “oceanside view”. You’ll see this fantastic blue ocean all the way up! Personally, I really like Kealia trail because not many people know about this hike. The last time I was here I only ran into 2 families and 1 couple. The very top has a picnic bench, too, so it’s a good spot to rest before heading down. 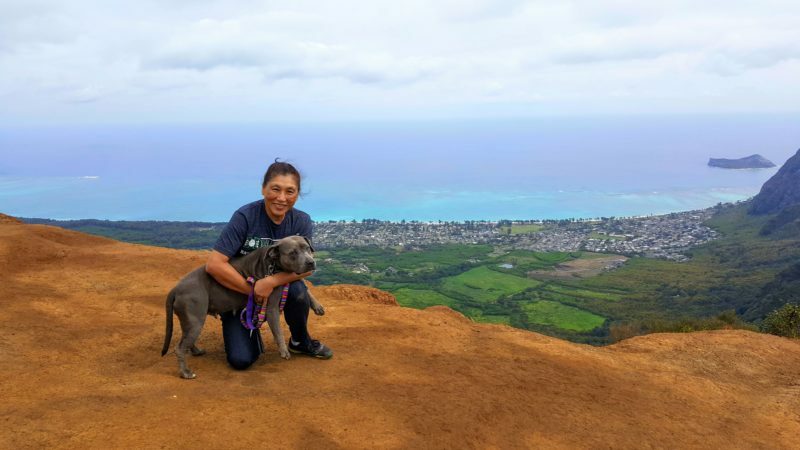 Local Tip: I’ve run into a couple of people who continue past the picnic bench to hike the Waianae mountain ridge. I’ve never done it but it’s on my list! The views never stop at the Kealia trail. For those who prefer pavement and smooth roads, you can’t do better than Hoomaluhia botanical garden. This place is huge, very well-maintained and the asphalt road goes through the whole park. You’ll see plenty of native Hawaiian and thriving tropical plants and maybe the odd mongoose or two. There’s a visitor center near the beginning where you can learn about the different trees and plants and how ancient Hawaiians used them to their advantage. There’s even a fishpond a short walk away where you can go fishing (a limited supply of poles are available at the center). Local Tip: Hoomaluhia botanical garden is a great camping site. There are plenty of public bathrooms and it’s a safe park. There’s a guardhouse at the entrance during opening hours and no one can enter during closing hours. 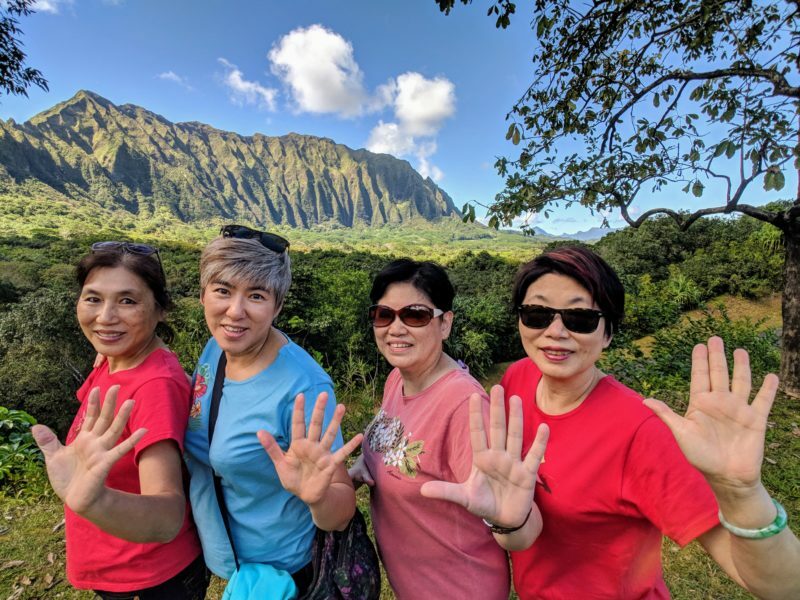 The Aunties could not stop posing in front of the Koolau mountains in Hoomaluhia. Do You Have A Favorite Non-Touristy Oahu Hike? The truth is that there are so many great Oahu hikes out there. I’ll continue to add to this list when I find a particularly great trail without the big crowd. Let me know if you think a certain Oahu hike needs to be on this list, too! 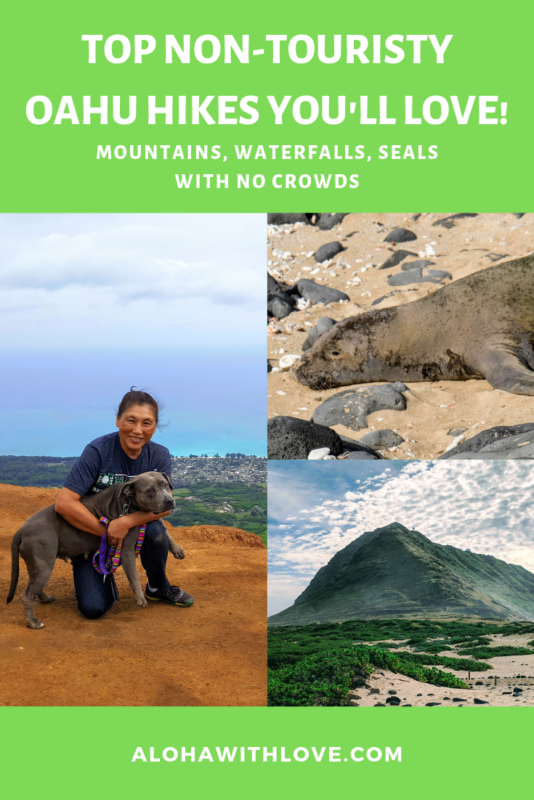 If you enjoyed this post on the best uncrowded hikes in Oahu and plan to visit Hawaii someday, sign up below to get my local Hawaii tips. It’s free and I can’t wait to help you plan the perfect Hawaii vacation.